Reprinted from Tarot Notes – Major and Minor, a blog by Zanna Starr. To see the original article click HERE. Ana Cortez, the author of The Playing Card Oracles (A Source Book for Divination), describes the book as “the result of a remarkable journey that began more than twenty years ago, a journey not of miles but personal discovery.” I invited Ana to join us here at Tarot Notes to talk about her journey and how we all might benefit from what she has learned. Hello, Ana, and welcome to Tarot Notes: Major and Minor! Tarot Notes (TN): I love the part of your book where you describe the first time you saw your father’s paintings of playing cards. Would you tell our blog readers a little bit about that experience? 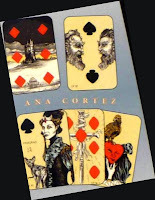 Ana Cortez (AC): Certainly! As I remember it, I was in the ninth grade, visiting Dad from out of state, as my parents were not together at that time. Well, my dad’s whole house was kind of like a museum of things strange, to begin with. One day he took me down the narrow creeky staircase to the basement to see his current project. 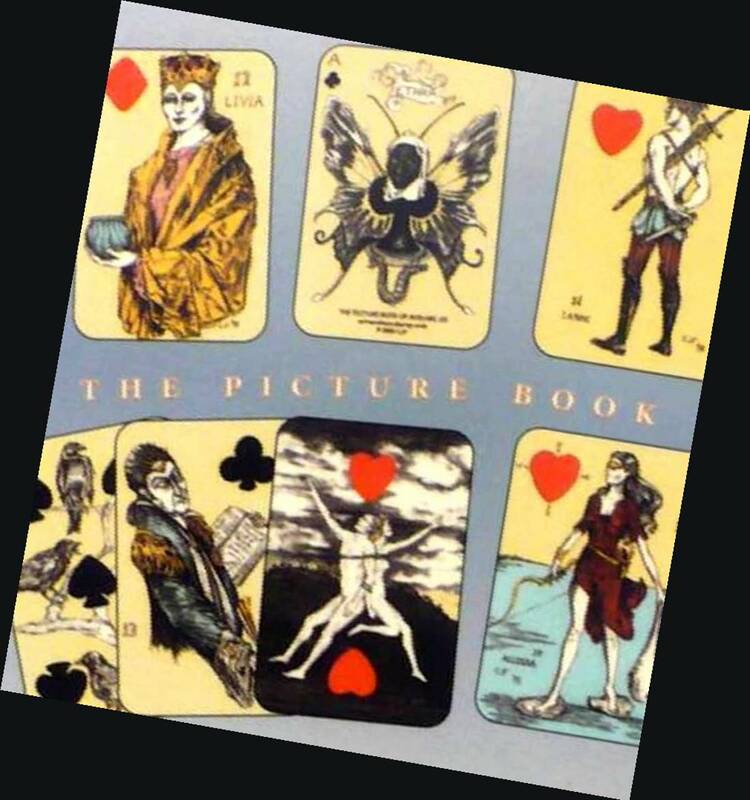 There were teeny tiny rooms – dirt floors – stuffed with stacks of large paintings, the image for the King of Hearts in progress on the easel. He was weird looking, no doubt. Sort of ghostly with flouncy vermillion attire. My dad showed me how the names of my sister and myself had been worked into the folds of the fabric on this King. Really, to me at the time, it was just one more curious thing my dad was doing. TN: In the book you mention learning about reading the cards from a woman named Lainy and another woman called Laddy LaDoux. How did those experiences propel you along your path? AC: Well, Lainy in particular made a huge impression on me in terms of card reading. She was equally as strange as the weird things my dad was collecting in his house. He took her in from the street and taught her card reading. He pasted together a 52-card deck for her using photographs of his paintings from the basement. She had such a peculiar and child-like way of looking at things. She existed in her own magical world. To me (at about age 18), it was the first adult I had ever seen who lived like a child. This is so important in tapping in to messages from the Spirit world – to be like a child. She taught me this. 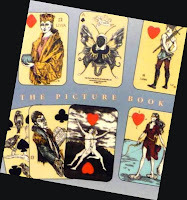 TN: How old were you when you decided to write a book about reading the cards? Were you inspired or prompted by anything in particular at the time? AC: I guess I was about 30 or 31 years old, on the heels of a crushing Saturn return. Writing the book was my therapy. Meditating on the cards was a way to focus my energy. Also, along with this, I felt a very palpable calling, or responsibility to write the book. The information that was coming through about the 52-card deck was so profound, so detailed, and so unlike anything else that my dad and I realized we had to document everything. TN: Would you explain to our readers how a deck of playing cards can be seen as a “time machine”? AC: Well, it actually is a time machine put into card form. This allows you to shuffle and cycle through time. The numerology in the deck is so obviously derived from natural time keeping. I hear people pull numerological correspondences together as proof for this and that just seems like such a stretch. The 52-card deck is not that way. It is plain, simple, and obvious. 52 cards are the 52 weeks of the year and the 52 years of the Mayan cycle. The 4 suits are the 4 seasons of that year. The 13 cards in each suit represent the 13 weeks in each season. Did you know there are exactly 13 weeks in each season? I did not know that until I studied the cards. If you add every number in the suit, you get 91 – and there are exactly 91 days in each season. 364 numbers total in the deck, corresponds to 364 days in the lunar year. The deck is a lunar or natural calendar. So we must use it as such. There is no known game that uses a calendar, except of course, the game of prophecy. TN: Do you have a favorite memory or story about a specific reading that you did using the methods you describe in The Playing Card Oracles? AC: Oh there are so many. I have been reading this way for so long. If I have to choose, it is typically the most recent reading I have done, because they linger with me. To me, to be a good reader, you are always learning from your cards – always maintaining that child-like perspective. When anything feels stagnant it is time to re-evaluate how you are doing your readings. My expectation with each reading is to be the child walking out the door into my very first snowfall. TN: In the book, you write that geomancy “makes use of the seven original planets of astrology plus the North and South Nodes of the moon.” How would you describe the degree of difficulty involved in using geomantic calculations with a playing card deck? AC: Oh, it is so easy. I am surprised at how many people assign difficulty to this aspect of the system before they have given it a try. It is as easy as throwing an I-Ching figure. Odd and even. It is not hard. Learning the meanings of the 52 cards and how to lay them out should be more intimidating than learning the 16 figures of geomancy. Plus, always, you pull in the information that is useful in a reading. Not everything on the table is relevant. The amount of information possible in a spread would be overwhelming if you attempted to analyze every single detail. That is not necessary to give a good reading. AC: I so appreciate the opportunity to give this interview, Zanna! The 52-card deck has existed under a veil for so so long. It is time for the gifts encoded here to come out into the open. We have been in the dark ages for so long, on so many levels. It is no coincidence that the secrets embedded in the deck so many centuries ago are coming out now (like everything else!! ), as we approach the galactic center. For related links and to see the original article at “Tarot Notes – Major and Minor” click HERE. For reviews, information, and limited time free eBook link for The Playing Card Oracles, click HERE. Previous article“REVERSALS” GOT YOU DOWN? I think you would find much help there. I would love to hear more questions from you <3 Thanks again.